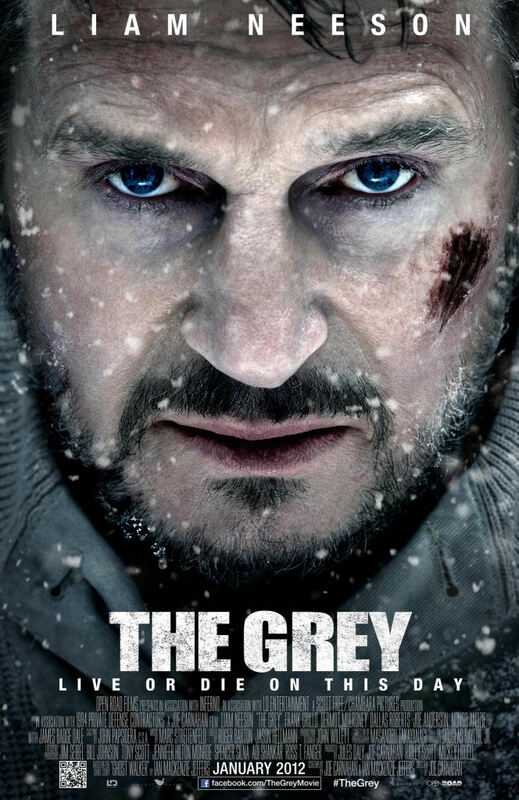 The Grey certainly is a far cry from Never Cry Wolf. In the new thriller, the CGI and animatronic canis lupus creatures are preternaturally immense, relentless carnivores with an appetite for human flesh. The earlier film by Carroll Ballard, which came out in 1983 and was adapted from Farley Mowat’s wonderful 1963 book of the same title, makes the case that wolves feed primarily on rodents. Both movies are in the Arctic adventure genre. The chief distinction may be that the older story is about man learning to understand and coexist with nature while the current release depicts man versus nature in a bloody mismatch. 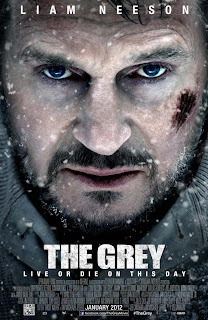 Yet The Grey, which stars Liam Neeson as the alpha male among a pack of survivors stranded in the vast Alaskan tundra after their transport plane crashes, is a surprisingly meditative saga. 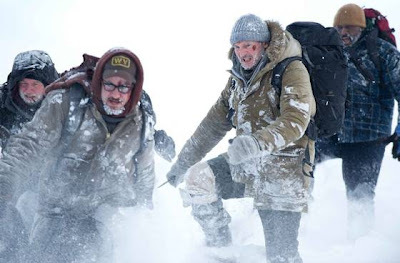 As they try to elude the snarling predators by trekking through deep snow without weapons, these guys somehow find time to debate whether or not there is a God. If the answer is yes, we see little evidence that a supreme being is on their side. In addition to the threat of territorial wolves, the men are just as likely to face doom in the form of hypoxia, storms, heights and river rapids amid the beautifully photographed (by Masanobu Takayanagi) vistas of British Columbia, standing in for America’s largest and least populated state. The characters, whose numbers dwindle, begin as blue-collar workers at a remote petroleum pipeline operation. In voice-over narration, Ottway (Neeson) explains that his job as a sharpshooter is to protect them from local marauding mammals, including bears. But when not sadly remembering a wife who’s now gone (Anne Openshaw in flashbacks), he describes his current situation in the midst of colleagues deemed “drifters, fugitives, ex-cons and assholes.” Although that’s the supposedly motley crew with him aboard the aircraft that never makes it back to civilization, as the movie progresses they emerge as interesting, complex individuals. Maybe they’re just working for Big Oil at an inhospitable locale because employment is so scarce in the Lower 48 these days. Talget (Dermot Mulroney) comes across as a bespectacled nerd and loving father of a young daughter. Hendrik (Dallas Roberts) is perceptive, compassionate and brave. The cynical Diaz (Frank Grillo) has a chip on his shoulder and a prison tattoo on his neck that reads “no mas.” That’s Spanish for “no more” but, of course, he will endure a lot more before the 117-minute film is over. Burke (Nonso Anozie), the only African-American in the bunch, develops some dire health issues. Flannery (Joe Anderson) is a talkative neo-hippie. Lewenden (James Badge Dale) isn’t around long enough to register much of a personality. Awoo! The script that Ian Mackenzie Jeffers co-wrote with director Joe Carnahan (The A-Team, an execrable 2010 remake) wisely balances macho with meaning. When Diaz proclaims, “We’re the animals!” to boast about the rare defeat and devouring of a single wolf, it’s clear the viewer will muse: ”Well, yes, but that won’t do you much good without claws and exceedingly sharp teeth in a dog-eat-dog wilderness.” Bravado is pointless in such a harsh environment, where even strategic thinking – Get to the tree line! Build a fire! – only goes so far. The furry non-Homo sapiens, at least as they’re portrayed here, are equally calculating. During the meal of stringy roast wolf, Henrik demonstrates a wee bit of comic relief when he quips: “I’m actually a cat person.” Me, too, especially after witnessing the damage that can be done by the biological ancestors of today’s domesticated dogs. Ottway senses that the ability to face death with philosophical grace is the ultimate defense against the world’s random cruelty. This loner who starts out feeling suicidal becomes a life-affirming warrior even as he peers into the seemingly inevitable abyss. Neeson’s recent roles as an action hero (The A-Team, Taken in 2008, the awful Clash of the Titans in 2010, and Unknown in 2011) have been far more superficial. He’s an actor with the necessary gravitas for The Grey, playing a pragmatic dude whose brains and sensitivity outclass his brawn. 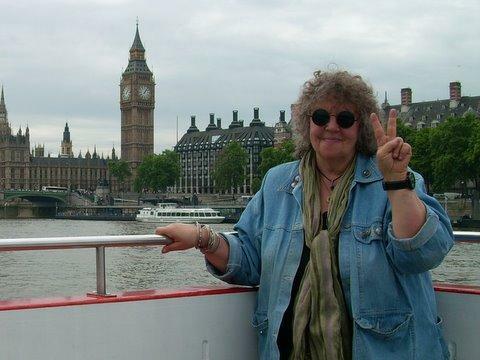 Goodbye “Release the Kraken!” Hello, Nobody Dances with Wolves. Thanks. Comprehensive review with a great compraison in the beginning.